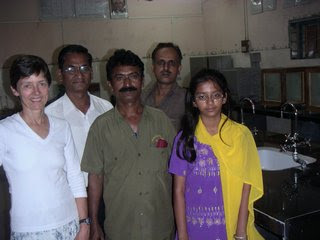 Ginny's Kiwi Adventures: Mumbai, India! I went to India for 3 weeks to visit Amy. It was an awesome trip but I think I’ll just try to cover the highlights. It took 48 hours to get from Christchurch to Jamkhed, which is 350 km east of Mumbai. But that included a 7-h sleep in a little travelers’ hotel in the Singapore airport and a 12-h stopover in Mumbai that included giving an impromptu lecture at a college in New Bombay! India was overwhelming from before I even landed. There is a huge slum in Mumbai that extends right up to the fence around the runways. I had heard about it and even seen photos of it, but seeing the real thing come in to view as we approached the runway was staggering. It extends for what seems like miles and it looks like one huge irregular black roof. I guess the roofing material people use extends over to cover the walkways so it’s just an endless expanse of roof. I was told that nearly half the population of Mumbai lives in the slums. Shrilathi, one of Amy’s classmates from her course in Jamkhed lives in New Bombay, a suburb of Mumbai and she picked me up from the airport. We took a taxi to her apartment and that was quite an experience also. We drove past the slums and it appeared that there were open sewers that just ran into gutters along the road. Between the smells and the noise, I did not have to open my eyes to know that I wasn’t in New Zealand anymore! Driving in India and in Mumbai in particular is quite an experience. There are 3 million taxis in Mumbai – an impressive number when I think about the fact that there are 4 million people in all of New Zealand! The good news is that all of the taxis have been converted from petrol to natural gas to help relieve the terrible air pollution there. In addition to cars, trucks, taxis and motorcycles on the roads, there are bullock carts and auto rickshaws. 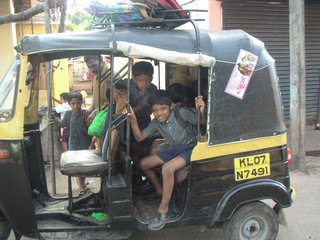 Auto rickshaws are little open-air 3-wheel vehicles that are pretty cheap so everyone takes them (see photo). The first thing I noticed is the endless honking. At first it just seemed like utter chaos but after a while I realized that there was some method to the madness. Everyone is always wanting to pass because of the range of vehicles and animals on the road. When you pass, you honk to let everyone know. There seem to be little toots for fairly safe passing and longer, more urgent honks that seemed to say – there’s another car coming towards me and they’ll probably pull over onto the shoulder to let me by if I don’t make it but just in case they don’t can you please slow down and pull over a little so I can get past you without killing everyone in this vehicle?! The first few times it was a little hair-raising but eventually I got used to it and only one driver on the whole trip managed to bruise my shins when he freaked out and slammed on the brakes. Fortunately that happened on the last day of our trip so I didn’t have a heart attack! The other interesting thing about honking as that the trucks and buses have horns that play tunes. Rather entertaining except in the middle of the night on the sleeper bus to Mumbai when the driver honks the horn about every 5 minutes! The two other driving things that were a little hard to get used to in Mumbai were 1) everyone ignores the white lines separating lanes of traffic so there would be 5 lanes of traffic when the road was marked for 3 and 2) if there isn’t traffic coming, no one even slows down for a red light. Shri’s husband, Solomon, came home late morning and asked me if I’d be willing to talk to some of his students that afternoon as they would be interested in meeting a doctor from the US who does research. He teaches Science at a local college in New Bombay. I said OK, envisioning sitting down with 4 or 5 students for a little chat. Well, it turned out to mean giving a lecture for an hour to over 100 students! And that after traveling for over 24 hours! I was sure happy that I got that sleep in the Singapore airport! Somehow I survived and then Sweety (Shri and Solomon’s lovely 12 yo daughter) and I had tours of all the labs. It was actually quite fun in the end.